The UAE General Civil Aviation Authority (GCAA) published a Preliminary Report of their investigation into the September 2010 fatal accident involving a UPS Boeing 747-400F. The report amongst others indicates that the captain had to leave his seat in search for portable oxygen in the smoke-filled flight deck. After which there was no further CVR information that indicated any further interaction from the Captain for the remainder of the flight. Also, the report stated that there were no declared shipments of hazardous materials onboard the airplane. However, at least three of the shipments contained lithium ion battery packs that met the Class 9 hazardous material criteria. A Boeing 747-44AF (SCD) cargo plane, registered N571UP, was destroyed in an accident shortly after takeoff from Dubai Airport (DXB), UAE. Both crew members were killed in the crash. On September 3rd 2010, Flight UPS6 arrived from Hong Kong on a scheduled cargo service flight into Dubai (DXB) carrying among other items consignments of cargo that included lithium batteries. There were no declared shipments of hazardous materials onboard the airplane. However, at least three of the shipments contained lithium ion battery packs that met the Class 9 hazardous material criteria, according to the report. The aircraft was parked at the loading position at 15:35 local time. Several Unit Load Devices (ULD) were offloaded and new ULDs were loaded onto the plane. The flight then took from Dubai at 18:51. The First Officer was the Pilot Flying, the Captain was the Pilot Non Flying (PNF) for the sector to Köln/Bonn-Konrad Adenauer Airport (CGN), Germany. The take off and climb out from Dubai was uneventful with the exception of a PACK 1 fault which was reset by the PNF at 18:55. The flight transited from UAE airspace into Bahrain Airspace where, at 19:12, the fire bell alarm sounded on the flight deck. The airplane was approaching top of climb (FL320) at the time. Following the fire bell annunciation, the Captain assumed control of the aircraft as PF, and the First Officer reverted to PNF while managing the fire warnings and cockpit checklists. The Captain advised Bahrain Air Traffic Control (BAH-C) that there was a fire indication on the main deck of the aircraft. The crew informed BAH-C that they needed to land as soon as possible. BAH-C advised the crew that Doha International Airport (DOH) was at the aircraft’s 10 o’clock position at 100 NM DME. DOH was the nearest airport at the time the emergency was declared, Dubai (DXB) was approximately 148 NM DME. The Captain elected to return to DXB, and following the request to land as soon as possible to BAH-C, the crew declared an emergency. BAH-C acknowledged the request, cleared the aircraft for a series of right hand heading changes back to DXB onto a heading of 106°. At approximately 19:14, the Auto Pilot (AP) disconnected, followed at 19:15 by a second audible alarm similar to the fire bell. At about this time the flight crew put on the oxygen masks and goggles. The crew experienced difficulties communicating via the intercom with the masks on, which interfered with the Cockpit Resource Management (CRM). Following the initiation of the turn back to DXB, having been cleared to 27,000 ft, the crew requested an expedited, immediate descent to 10,000 feet. Following ATC clearance, the flight crew initiated a rapid descent to 10,000 ft. BAH-C advised the crew that the aircraft was on a direct heading to DXB and cleared for landing on DXB runway 12 left at their discretion. The Fire Main Deck checklist was activated. According to the system logic, the cabin began to depressurise, PACKS 2 and 3 shut down automatically, and PACK 2 and 3 positions were then manually selected to OFF on the overhead panel in accordance with the checklist instructions. At 19:15, PACK 1 shut down, with no corresponding discussion recorded on the CVR. A short interval after the AP was disengaged, the Captain informed the F/O that there was limited pitch control of the aircraft in the manual flying mode, the Captain then requested the F/O to determine the cause of the pitch control anomaly. During the turn back to DXB, the AP was re-engaged, and the aircraft descent was stabilised at 19:17. The Captain told the F/O to pull the smoke evacuation handle. This was not part of the Fire Main Deck Non-Normal checklist. The Captain informed BAH-C that the cockpit was ‘full of smoke’ and commented to the F/O about the inability to see the instruments. The Captain instructed the F/O to input DXB into the Flight Management System (FMS). The F/O acknowledged the request and commented about the increasing flight deck temperature. 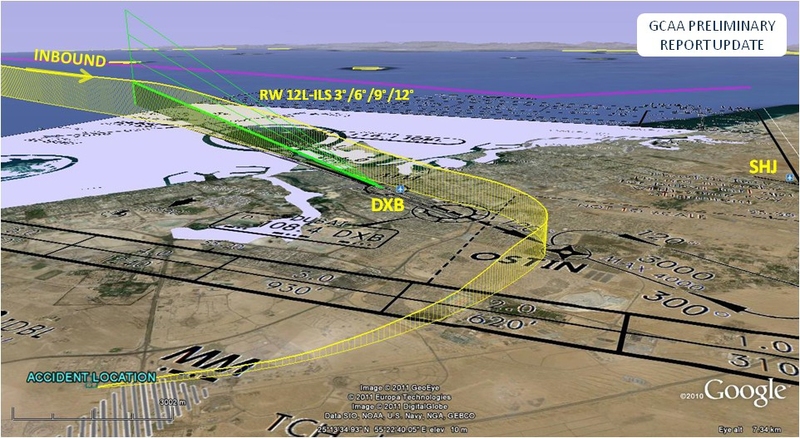 It was not clear from the CVR if the FMS was programmed for DXB, although the DFDR indicated that the ILS/VOR frequency was changed to 110.1 MHz which was the frequency for DXB RW12L. Based on the information available to date, it is likely that less than 5 minutes after the fire indication on the main deck, smoke had entered the flight deck and intermittently degraded the visibility to the extent that the flight instruments could not effectively be monitored by the crew. At approximately 19:19, during the emergency descent, at approximately 20,000 ft cabin altitude, the CAPT, as PF, declared a lack of oxygen supply. Following a brief exchange between the Captain and F/O regarding the need for oxygen, the Captain transferred control of the aircraft to the F/O as PF. Portable oxygen is located on the flight deck and in the supernumerary area, aft of the flight crew’s positions when seated. At this point the recorded CVR is consistent with the Captain leaving his seat, after which there is no further CVR information that indicates any further interaction from the Captain for the remainder of the flight. The normal procedural requirement of transiting into the Emirates FIR, inbound for DXB was a radio frequency change from BAH-C to UAE-C. At 19:20, BAH-C advised the crew to contact UAE-C. At approximately the same time, the PF transmitted ‘mayday, mayday, mayday can you hear me?’. The PF advised BAH-C that due to the smoke in the flight deck, the ability to view the cockpit instruments, the Flight Management System (FMS), Audio Control Panel (ACP) and radio frequency selection displays had been compromised. At 19:21, the PF advised BAH-C that they would stay on the BAH-C frequency as it was not possible to see the radios. The PF elected to remain on the BAH-C radio frequency for the duration of the flight. At approximately 19:22 the aircraft entered the Emirates FIR heading east, tracking direct to the DXB RW12L intermediate approach fix. The aircraft was now out of effective VHF radio range with BAH-C. In order for the crew to communicate with BAH-C, Bahrain advised transiting aircraft that they would act as a communication relay between BAH-C and the emergency aircraft. At 19:22, the F/O informed the relay aircraft that he was ‘looking for some oxygen’. Following the rapid descent to 10,000 ft the aircraft leveled off at the assigned altitude approximately 84NM from DXB. At approximately 19:26, the PF requested immediate vectors to the nearest airport and advised he would need radar guidance due to difficulty viewing the instruments. At around 19:33, approximately 26 NM from DXB, the aircraft descended to 9000 ft, followed by a further gradual descent as the aircraft approached DXB, inbound for RW12L. The speed of the aircraft was approximately 340 kts. 19:38, approximately 10NM from RW12L, BAH-C, through the relay aircraft, advised the crew the aircraft was too high and too fast and requested the PF to perform a 360° turn if able. The PF responded ‘Negative’. At this time the DFDR data indicated the gear lever was selected down, the speed brake lever moved toward extend and at approximately the same time there was a sound consistent with the flap handle movement; shortly afterward the PF indicated that the landing gear was not functioning. The aircraft over flew the DXB northern airport boundary on a heading of 117°, the aircraft speed and altitude, was 340 kts at an altitude of 4500 ft and descending. Following the over flight of DXB, on passing the south eastern end of RW12L, the aircraft was cleared direct to Sharjah Airport (SHJ) as an immediate alternate – SHJ was to the aircraft’s left and the SHJ runway was a parallel vector. The relay pilot asked the PF if it was possible to perform a left hand turn. The PF responded requesting the heading to SHJ. The PF was advised that SHJ was at 095° from the current position at 10 NM and that this left hand turn would position the aircraft on final approach for SHJ (RW30). The PF acknowledged the heading change for SHJ. The PF selected 195° degrees on the Mode Control Panel (MCP). The AP disconnected at 19:40, the aircraft then entered a descending right hand turn at an altitude of 4000 ft as the speed gradually reduced to 240 kts until the impact. Several Ground Proximity Warning System (GPWS) caution messages were audible on the CVR indicating: Sink Rate, Too Low Terrain and Bank Angle warnings. Radar contact was lost at approximately 19:41. The aircraft crashed 9nm south of DXB onto a military installation near Minhad Air Force Base.